Martha Weber is an oil painter of landscapes with a studio in the Pendleton Art Center, Cincinnati. She has been a painter and printmaker since 1980. Her paintings are owned by individuals and corporations both in the United States and Canada and are included in the collections of Cinergy Corp., Cincinnati Country Club and Cincinnati Financial Corp. in Cincinnati, Ohio. Ms. Weber’s works have been exhibited in one-person shows and in juried local, national and international exhibitions. Her art studies were done at the Cincinnati Art Academy, Edgecliffe College, Northern Kentucky University and with renowned individual artists. Ms. Weber exhibits at the Pendleton Art Center, Studio #809, in Over-the-Rhine. 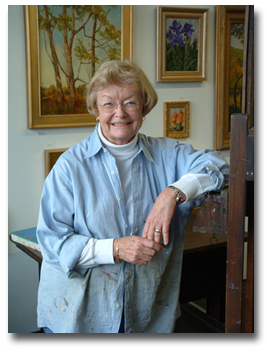 The artist is a member and past president of the Cincinnati Art Club; Woman’s Art Club; American Impressionist Society; Tiger Lily Press; and the Ohio and Indiana Plein Air Societies.